Kanchenjunga is the 3rd highest peak in the world, stands extensive and tall at the height of 8586 meters. But the highest concerning the fatality rate, it requires a fit physique and proper mountain climbing skills for the Kanchenjunga climbing. The Mount Kanchenjunga is an eastern border between Nepal and Sikkim. Due to the fact, is composed of 4 major peaks namely the principal summit, middle summit, south summit, and the Yalung yang. From time to time, Yalung Yang seems separate from the other three mountains. The Yalung Yang climbed in 1975 whereas the main summit was in 1977 because of remoteness territory and tough ascension. 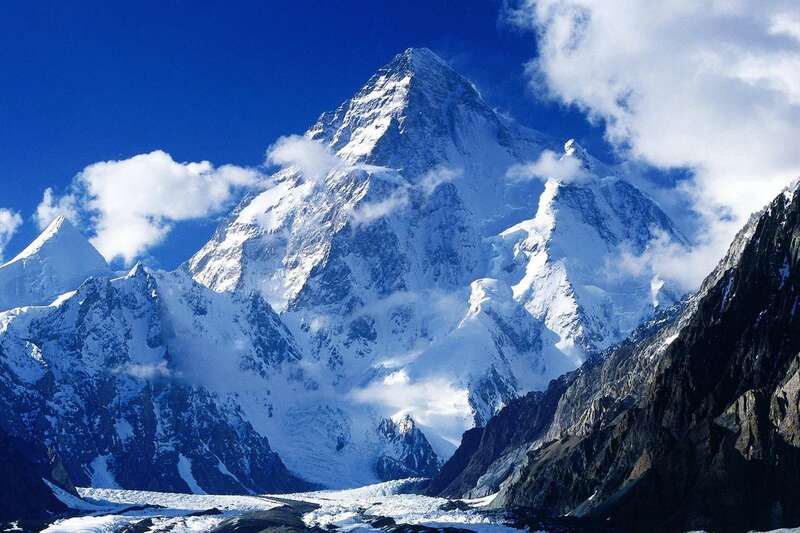 Therefore, rated it as a least climbed peak among 8000 meters. Due to the least climbed mountain, you should have to well-prepared and things to know about Kanchenjunga trek before ascension. The Kanchenjunga expedition begins with a flight either from Biratnagar to Suketar or a trip to Bhadrapur and drives towards Taplejung. 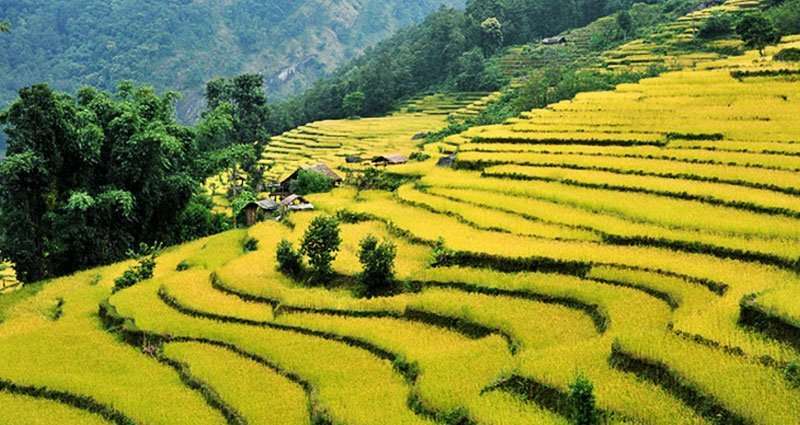 Furthermore, it follows the villages and forests all the ways into the Kanchenjunga Base Camp. It lies at an altitude of 4500 meters at the same time as some consider the northern route up to the mountain to be straightforward. There is no such easy route as all the paths disclose due to avalanche and rock fall possibilities. Acclimatization on every step is obligatory but a previous mountaineering experience required as nicely. Following the strenuous trek to the base camp, the acclimatization procedure will conduct regularly. Although being properly acclimatized with the weather conditions and altitude issues, climbers are prepared to make the final attempt. So, it is compulsory for placing up different camp to attempt the summit for the Kanchenjunga Expedition. 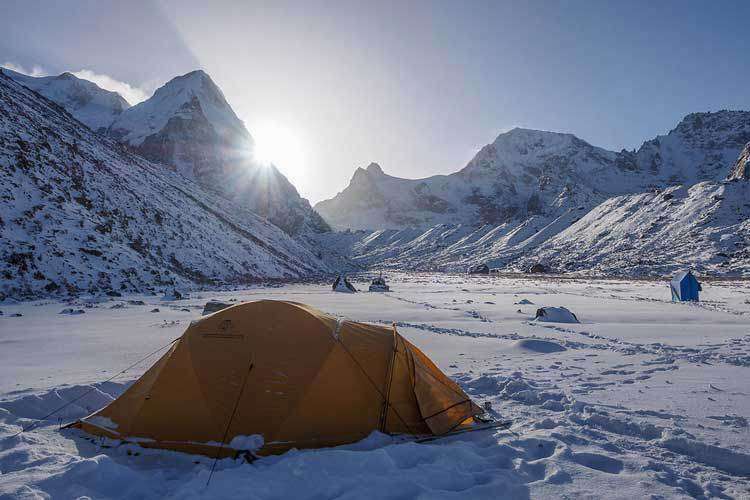 The 1st camp lies at the height of 6050 meters whereas camp 2nd lies at 6800 meters. It requires to spend a night or two, making a return to the base camp during the Kanchenjunga climbing. 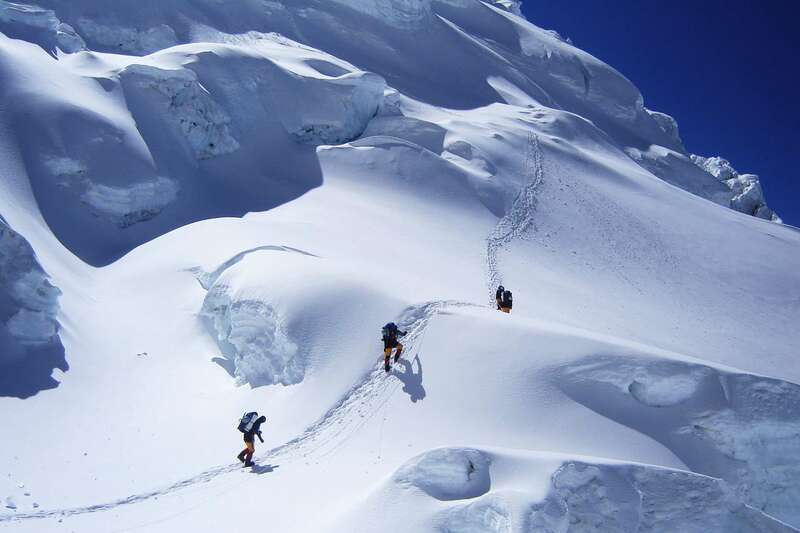 It is noteworthy for proper acclimatization while setting up 3rd Camp at 7300 meters, and camp 4th lies at 7800 meters. Eventually, attempts to the summit. So, the climb to the summit from the base camp is a long tiring practice. Typically, the Kanchenjunga climbing ends with a retrace to Ghunsa, but it starts over another trail via col of Selele toward Tsaram. Besides, a possibility to explore South Kanchenjunga Base Camp and expand a journey to Makalu via Lumba Sumba Pass. This whole expedition is a one in a million, adventurous experience but requires almost 45- 50 days for completing. Day 3: Flight to Bhadrapur and drive to Kanyam. We will take a flight to Bhadrapur hot and humid Bhadrapur near India Boarder and drive to Kanyam nice and peaceful tea garden stay overnight at Guest House. Day 4: Drive to Taplejung and continue to Chiruwa 1185 m.
Drive toward the eastern highway to Taplejung and after Taplejung recently build dirt road to Chiruwa via mitlung and Tawa village about 7 hours stay overnight at Tea house. We are gradually climbing up for the couple of hours then descend to the lush green forest. The trail goes following the Tamor River to get Olangchung Gola This day. Also, we walk uphill for some time and descend to the lush green vegetation. Then, we follow the Tamur River to the OlangChungGola, the entry point of Kanchenjunga National Park. An easy and short walk to Sekathum. Day 6: Trek to Amjilosa (2490m). We cross the River and take a steep trail up to the hill then descend to another side of a hill and cross the river again. Walk along the steep pathway and descend to Amjilosa. We walk along the river bank traverse through the dense forests of Bamboo, Rhododendron, and others in lush green scenery and accompany of the waterfall along the trail, then finally we reach in the Tibetan settlement of Gyabla. This is famous place in the region where popular conservationist was a tragic end in the Helicopter crash. We descend towards the river valley after couples of hours that can reach in Gunsa. Day 9: Rest & Acclimatization day! This day, we take full rest for acclimatization with the exploration of local areas. We make a short hike towards the Lapsan La through the lush green forest. We will stay overnight at our campsite. After exploring Ghunsa and its surroundings, we continue our trek further north along the river bank. We walk through the trees and plants. We cross many suspension bridges over the river, and pass waterfalls and finally reach Kambachen. Day 11: Rest and exploration day!! We will take an opportunity for the acclimatization with an exploration of local areas and make a possible side trip to Junu Himal Base Camp. 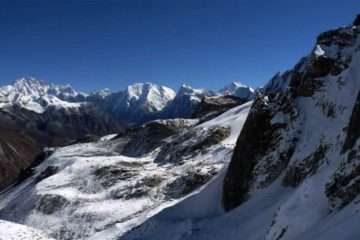 Junu Himal is known as Kumbhakarna Himal. One of the memorable day entire trek to Kanchenjunga. The trail gradually goes uphill through the rocky fields in the hillside along the river, passes the waterfalls and cross a bridge then descend toward the river to get Lhonak. This day, snow paced walk up ascending path on grassy trails. 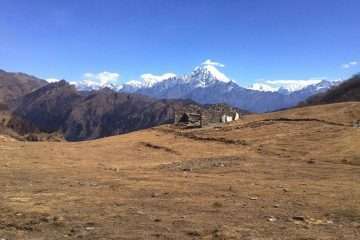 We see the splendid view of the Chang Himal on our right. Finally, we reach the Pangpema known as Kanchenjunga North Base Camp. Rest day!! prepare for the expedition and walk side trip for acclimatization. Following the strenuous trek to the Base Camp, trekkers are advised to climb to a certain higher level from the base camp and return and climb higher the next time and repeat the process again. After being properly acclimatized with the weather conditions and altitude issues, climbers are ready to make the final attempt. Day 36: Cleaning Base Camp. After the final successful climbing of Kanchenjunga, collect all the garbage produced by expedition activity that needs to be clean up to protect the environmental concern. We walk back our path to Lhonak and continue downhill walk the valley to Ramtang. On the way, we will get an opportunity to enjoy the panoramic views of Kanchenjunga, Gimmigela Chuli, Taple Shikhar, Kirat Chuli and many more. Finally, we descend to Kambachen by evening. We retrace the same trail while we climb to Kanchenjunga Base Camp. Finally, we descend to Kambachen by evening. Today, the same trail which we follow while climbing back to Ghunsa. Today, we walk to the dense forest of rhododendron and contouring the hillside with more fantastic views then we cross two low passes to the Sele Le. A super day of trekking today, as we cross three passes, including the Sinon La, Mirgin La (4480m) Sinelapcha La (4640m) and the en route for the north side of the mountain. Superb views, afterward to Tseram. 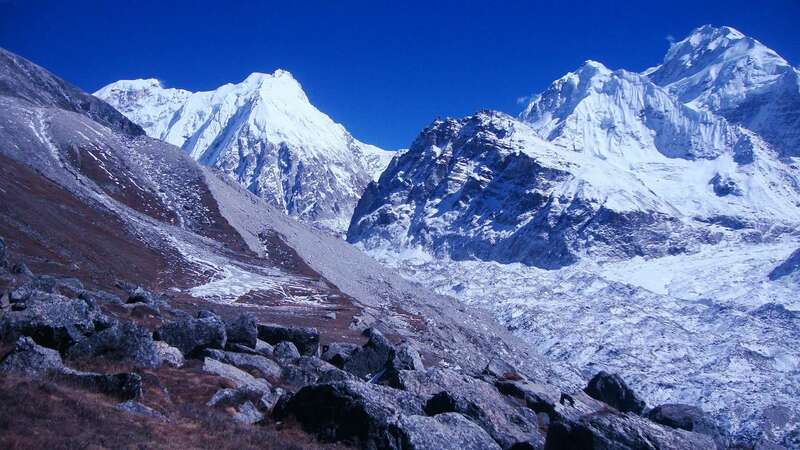 Today we have the option to trek up to the south side base camp for Kangchenjunga at Ramze. This area beside the Yalung glacier has superb mountain views. Today, we will back the same route to Tseram. Mostly, we walk downhill. Today, we gradually walk in the descending path to Yamphudin where inhabitants by different ethnic groups including Tamang, Rai, Limbu and as well as Sherpa. This day, as we walk along the Kabeli Khola negotiating terrace fields system above the stream, we pass small hamlets and cross low ridges to Anpan. This day, it is just hike to Taplejung, We visit the Taplejung bazaar. From Taplejung, we return back to Sukhetar. After walking uphill couples of hours, we reach the STOL airstrip of Sukhetar. In the morning, you take a flight to Biratnagar. And then, in the afternoon, you take the flight to Kathmandu. Day 49: Free day in Kathmandu. The day can be occupied as security day if the plane doesn’t flight in case of bad weather. Gratuity for Guide & Porters. Prices are quoted and payable only in (US$ dollars). All published costs on our website are set as low as possible. The Prices may vary at any time due to currency fluctuation, fuel prices, and unforeseen economic circumstances. However, we guarantee our prices which already signed up for your tour. Please consult us for a custom quote.